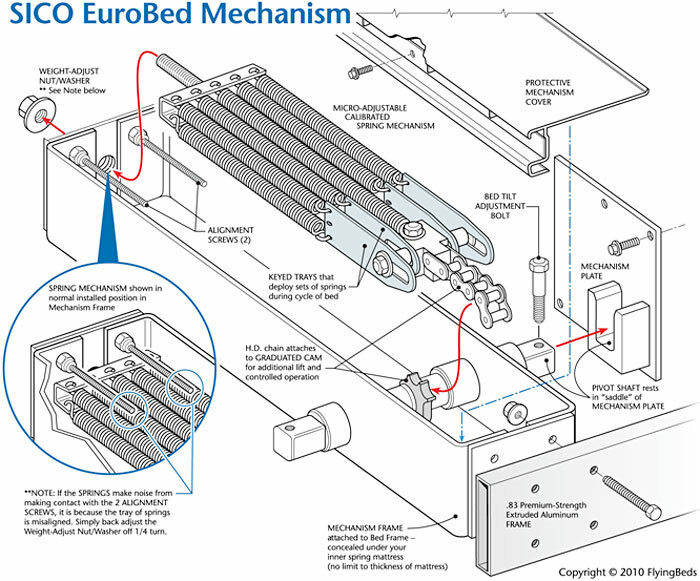 Relatively lightweight and compact, the SICO® Eurobed is the system meant for tight spaces. The flexible wooden-slat mattress support and powerful mechanisms provide comfort and effortless use. Each SICO wall bed system has a serial number attached to the metal frame. This indicates date of manufacture and calibrated lift package used to counter the weight of mattress and bedface panel. To our knowledge, no other Murphy Bed manufacturer has serial numbers assigned to their production. The majority don’t even print their name on it. Protected by a 5-Year Warranty on the frame and mechanism. Lifetime Warranty on welds. We have witnessed mechanisms working well after 20 years of constant use. Padded Buckboard — Made of 3/4″ (2cm) composite board with a 24 oz. 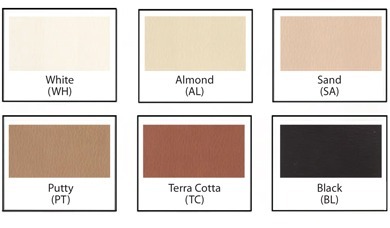 (672 grams) Naugahyde® vinyl covering – available in 6 standard colors. (See color list with swatches included on this page.) This supports the head of the mattress when the bed is raised. Custom-sloped headboard system available separately from FlyingBeds. Micro-adjustable Calibrated Spring Mechanisms — Nine factory-calibrated heavy-duty springs in each mechanism allows for precise tension adjustments. Located within the bed frame so no mechanical parts are seen. 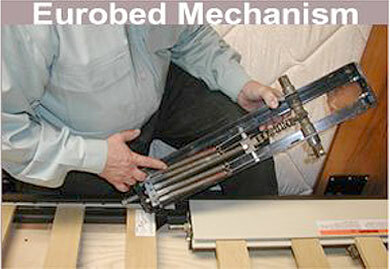 This mechanism is superior to other Murphy style-wall bed systems that use a few small helical springs or gas pistons. Each tray of springs are cantilevered to be called into action at separate angles of bed rotation. As the bed nears the down position, maximum strength is deployed. This feature is unique to SICO. Aluminum Bed Frame — Frame requires no assembly. Supported wood slat foundation for mattress is already installed in place for perfect alignment. Constructed from .83 premium strength extruded aluminum for maximum durability, and painted to match the headboard. 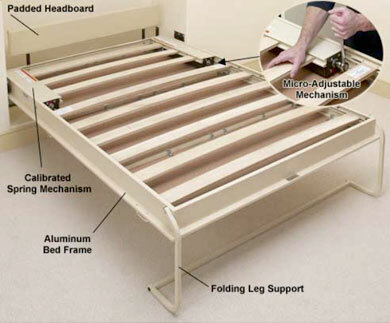 Folding Leg Support — Stabilizes the bed in the down position. It rotates to secure the foot of the mattress when the bed is in storage. Manufactured with 3/4″ x 18 gauge C.R.E.W steel tubing. Space Efficient Design — It can store in only 19” of depth. When lowered, the head of the bed is recessed 10″ into the wall bed cabinet. Extension into the room from the wall is only 9” more than the mattress size you choose. For mattresses thicker than 12”, sloped headboard option, and interior fabric paneling, please contact Denver showroom for ideal depth of bed storage cavity. Mounting System — See installation guide booklet. Your choice of wall or floor attachment, but bed must be secured for safe operation. Bed pivots off mounting brackets on inside of storage cavity. European Slat System — The built in wood slat foundation has a permanent steamed bow that flexes and compliments any American mattress. Adjusts to the contours of the body and replaces the box spring. The 24/7 Eurobed is designed for Sofa Beds. It features a longer leg for the greater height needed to lower through the sofa frame. Many options are available for customization of this model to allow height of mattress to become higher off floor. We know this mechanism inside and out. Please feel free to call us at the showroom with any technical questions not answered by the spec sheets. Call us at 888-892-4645 or 303-333-3052. For a shipping quote, give us your zip code and let us know if it is a residential or business address. [email protected] Standard delivery is curbside. There are options to upgrade delivery from curbside, to inside, to White Glove into the room of installation with packaging material removed. We would welcome your call at 303-333-3052 or 888-892-4645. We have over 30 years experience manufacturing custom sized SICO Eurobed systems for your special requirements. not be construed to imply the behavior of this or any other material under actual fire conditions.